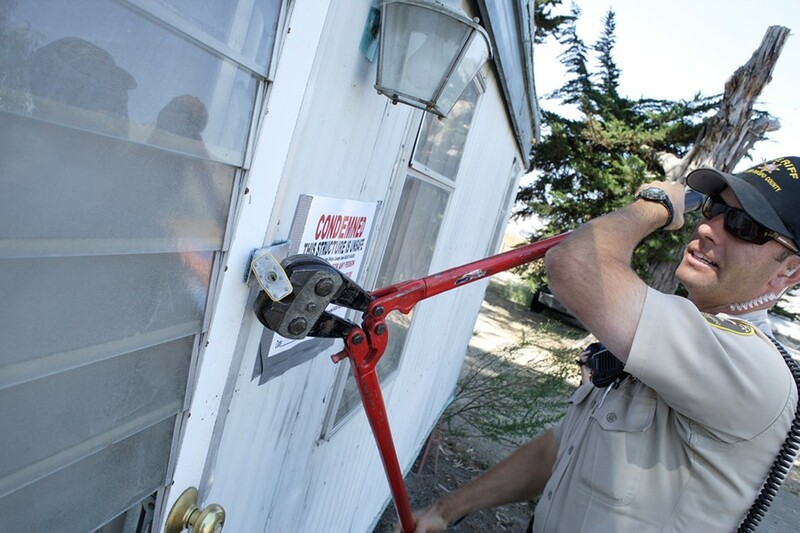 County Sheriff’s Deputy Peter Cramer cuts the lock off a trailer at the Sunny Acres treatment facility on Sept. 5. Enforcing a nuisance abatement order, county code officials condemned the trailers and replaced the locks to prevent residents from returning. For now, the residents who were in the trailers are living in tents on the ranch property, according to Steve Jones, Sunny Acres’ program manager. In other developments, the facility managed to obtain a permit so it can continue operating a roadside stand, but county officials have said they can’t sell planter-barrels or firewood, which have provided income to the program. “We need both to keep our program running,” Jones said. Owner Dan DeVaul also faces a Sept. 30 deadline to remove trailers, cars, and mobile homes.